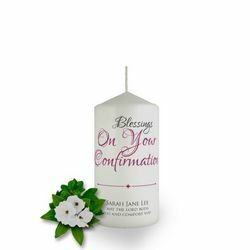 Our range of personalised confirmation candles are ideal as celebratory gifts or for the presentation ofsomeones confirmation. They preserve the wonderful communion occasion and can be displayed or kept as a family treasure. Celebrating a special sacrament in a child’s life is an event that often goes unforgotten. Brinley Williams has created a wide range of personalized candles that are special to mark this equally special day. 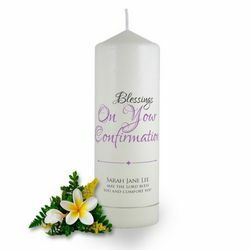 We offer confirmation candles that are a symbol of your faith and later on, enable you to take them home for preservation as a cherished heirloom. In later years it will remind the child of their faith, its practices and obligations. 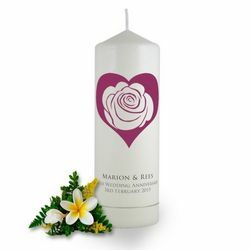 Offered with good value, our confirmation candles will certainly fit your theme in a meaningful and unique way. They easily stand out from all other decorations and are functional to suit your space and style. They are the perfect size, not too big, not too small but just right. You can count on our candles to meet all your celebratory needs. Burning evenly and beautifully, the candles’ mysterious charm revolves around not being antsy; showing down to reflect and savor each confirmation moment as the most wonderful illuminating surprise. Choose from our variety of the very best and get what you need at the best prices. Redolent with richness, they offer a bright, crisp and fresh product so that you can always look back and remember just how much the day meant to you and cherish all the treasured moments.